That doesn’t mean that there is no money at all in this. The trick is to find techniques to make some. I don’t need the millions (don’t get me wrong — I wouldn’t say no) but it would be nice to have a comfortable monthly income while I do something that I love doing. The flexible hours and work-from-home aspects are also very important to me. I’ve done some AdWords and haven’t seen much with that. It turns out you need lots of traffic to make any type of ads pay and I’m still struggling with getting traffic. I’m still working on my own e-book and studying as much as I can in the mean time. 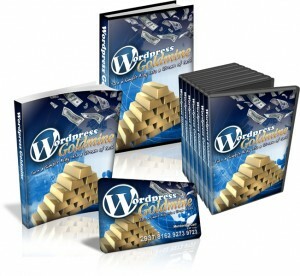 One product that I’ve stumbled upon that I intend to look deeper into is WordPress Goldmine. This is a membership product that offers a forum, e-book, videos and a selection of e-courses that are added to monthly. The cost is low which is a good thing for me. I’m just starting out and I can’t afford the high end prices of some educational products. There is also a 60 day money back guarantee and it is run through Clickbank which gives me a high feeling of security. I’ll be posting more as I explore the forum and the downloads. But in the meantime, if you’ve had any experience with this product, please leave some comments on what you’ve learned. I have posted my review of WordPress Goldmine. Check it out!